The China-Pakistan Economic Corridor is an exciting initiative – provided it is implemented professionally and with integrity. In a recent ‘Beijing Forum’ organised by NUST, Islamabad, and inaugurated by the president of Pakistan, I stressed the CPEC’s potential of having a sustainable and long-lasting impact on the economy of Pakistan if it can become a ‘knowledge corridor’. This will help Pakistan acquire expertise in cutting-edge technologies that are vital for industrial and agricultural development. The entire length of the CPEC needs to be dotted with industrial clusters that need to be accompanied by knowledge clusters so that high-quality research and training can be made available, with a focus on the manufacture and export of high-technology goods. This will require the establishment of a number of high-level technical training institutions, upgrading of our existing universities and setting up many ‘universities of applied science and engineering’ (on the ‘Fachhochschule’ model) that can provide the highly-trained technical professionals needed by the high-tech industries in various fields. The synergy between the industrial clusters and knowledge clusters should be magnified through the establishment of technology parks, business incubators and provision of venture capital funds for new product development. The private sector in China will need to play a critically important role so that the Chinese government’s investment of $46 billion in energy and basic infrastructure can lay the foundations for another $500 billion investment by the Chinese private sector over the next 15 years. Since a major portion of assistance from China will be in the field of energy, we need to understand where this sector is going and ensure that we benefit from it. The prices of electricity produced from solar energy are now below 3 cents per kWh while those from wind energy technologies are even less than that. The Dubai Electricity and Water Authority (DEWA) has recently received five bids from international organisations for the third phase of the Mohammed bin Rashid Al Maktoum 800MW Solar Park with the lowest bid being US 2.99 cents ($0.0299) per kWh. Similarly Enel Green Power signed contracts for 3.6 cents ($0.036) per kWh in Mexico and 3 cents/kWh ($0.03) in Morocco. According to media reports, we have established a 100MW solar plant through a Chinese company at a price over 300 percent higher than these rates – at 10 cents per kWh. It is said to be producing only 18MW although we paid for 100MW capacity. If these reports are correct, then the transparency in the bidding process becomes highly questionable. The Pakistan government should have set a maximum acceptable rate for energy of, say 3.5 cents/kWh, and refused bids above these rates. I was awarded the highest Chinese award (Friendship Award) by the Chinese government and I was also elected as foreign member of the Chinese Academy of Sciences. I strongly feel that the friendship between Pakistan and China is critically important for both countries and needs to be nurtured by preventing possibilities of corruption in the CPEC project in both countries. We need to establish a 5000MW solar plant in the Cholistan desert and supply electricity to industry at the cost of production plus 25 percent (at Rs4 per unit). This can jumpstart industrial production in Pakistan. Wind power is another area of strong growth and there have been significant reductions in costs of wind energy technologies. The US has been investing massively in wind power, and since 2007, 33 percent of all new US electric capacity additions are based on wind power, with some $8.3 billion being invested in 4.9 gigawatts (GW) wind power capacity additions during 2014 alone. In a report of the US department of Energy prepared by the Lawrence Berkeley National Laboratory, the prices offered by wind projects to utility purchasers had reached an all-time low of 2.5 cents/kWh. This has become possible because of improved power efficiencies due to new technologies incorporated in wind turbines. 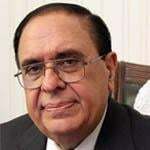 When I was the federal minister of science and technology during 2000-2002, I had initiated a project through the Pakistan Meteorological Department to collect wind data at different points in the country and at heights of 10m and 30m. The results obtained were startling. There was a huge wind corridor in Sindh in an area lying between Keti Bander, Gharo and Hyderabad as well as on the coastal areas of Balochistan with potential to produce 50,000MW of electricity. In an energy-starved country, this was like discovering a thousand new oil fields, and we should have set up huge wind power projects that could produce very cheap electricity at a cost of 2.5 to 4 cents per kWh immediately. Unfortunately, the whole project fell prey to corruption and even wind mills of 100MW capacity have not been installed. The price negotiated is also three times higher than the rates indicated above. I advise the government to partner with a suitable company for the manufacture and export of wind turbines, besides using them ourselves. They can be easily manufactured at the Pakistan Naval Dockyard and the Heavy Mechanical Complex. The two major threats to the CPEC are: externally sponsored state terrorism by countries determined to undermine this important project, and overbidding of prices by corrupt foreign companies in collusion with our government officials. To prevent the CPEC initiative from falling prey to massive corruption, a completely autonomous ‘CPEC Development Authority’ needs to be established under a group of top professionals of Pakistan, independent of the government, but including representatives of the armed forces. It needs to be understood that the real challenge for Pakistan is to have a visionary, technocrat government that can help it transition from the clutches of its low-value economy to a high value-added knowledge economy. Such a transition can only occur if the CPEC becomes a ‘knowledge corridor’ and is not just a road to carry Chinese goods to the Gwadar Port. The CPEC should therefore be renamed as the ‘China-Pakistan Economic and Knowledge Corridor’ (CPEKC).